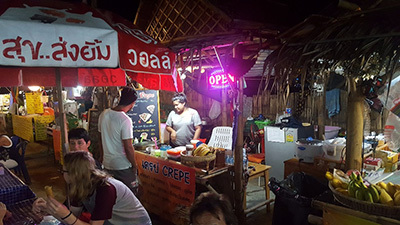 Thong Nai Pan Night Market was started at the end of 2016. It has already proved a hit with both locals and tourists. It provides more income for local businesses as well as an opportunity for visitors to experience an important part of Thai culture. Since its inception the night market has been well attended and it looks like it will continue to be for the foreseeable future. The night market is located opposite the 7-11 in Thong Nai Pan Yai. You will find it easily if you walk down the main road heading north (see map below). At present there are in total 8 stalls and a bar. As with many night markets in Thailand and South East Asia the focus is on food. In tropical weather it is pleasing to take the cool air and stroll around food stalls deliberating over what delicacy to try. It is a chance to socialise and court for Thais. 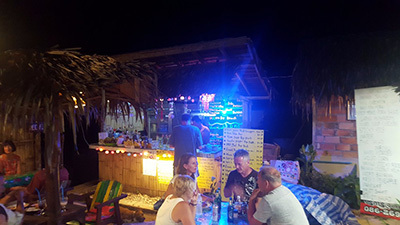 It is also a chance for tourists to Thong Nai Pan to experience the gentle atmosphere of a Thai night market in a beach setting. What could be better? There are 3 stalls selling Thai food. There is 1 Issan food stall. Another option is the crepe stall. Those looking for a sweet snack can try the 2 stalls selling fresh juice and mango with sticky rice. The final stall sells Thai snack food. You browse the stalls, make your purchase and then grab a table and chairs in the centre of the market. There is seating for about 40 people. Those who fancy a drink have the options of using the bar stall or nipping over to the 7-11. The bar shuts at 21.00. Food dishes cost between 30 and 80 Thai Baht depending on what you have. The beer prices at the bar are the same as in the resorts. The 7-11 option is slightly cheaper. 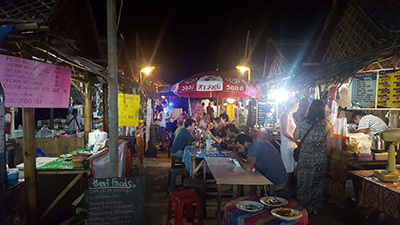 Thong Nai Pan Night Market is held daily from 16.00 to 22.00. It is run by locals and the food is cooked fresh. It is one of the best ways to try a wider range of Thai dishes than is offered by the resorts and restaurants. Moreover, it is cheap, fun and a unique part of Thai culture. For those who get the 'night market' bug and want to try other night markets we recommend Suratthani Night Market and Hua Hin Night Market.